In the heat of the moment I called it "The rally of the Gods" late Tuesday night. Can you blame me? I was excited about the billions of dollars of volume that flowed through the XRP Ledger. It started roughly around noon here in the Midwest United States on Tuesday. 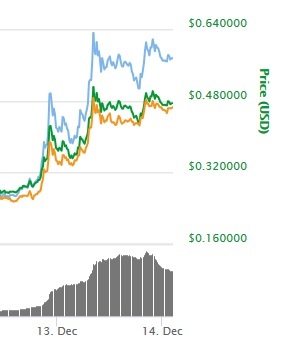 The price for XRP exceeded one Australian dollar at one point1 in the trading, and in US exchanges it broke 50 cents.2 The rally paused briefly and is even now continuing to new heights on Thursday morning. The excitement was palpable - and contagious! On Discord, the reaction of the XRP fan base was frenetic and upbeat; XRP was finally being recognized by the crypto market for its value, and reclaimed its #4 spot on coinmarketcap.com. 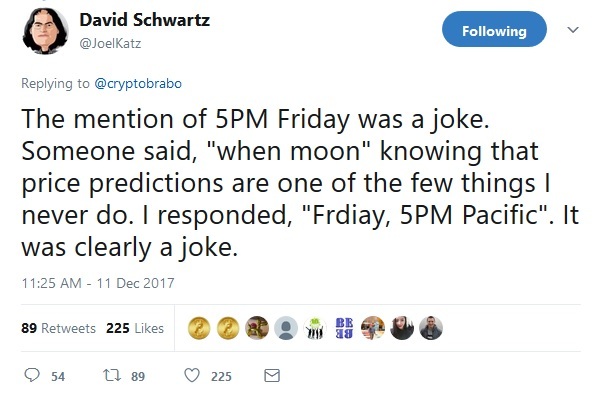 While these rankings are slippery at best, the psychological boost was powerful, prompting many who had temporarily left XRP to jump back in, after suddenly realizing that most of the fear, uncertainty, and doubt that they might have heard on various forums was just that - the paper tigers of lazy thinking. XRP was - and is - going to dominate crypto in a very big way in 2018; SBI's plans for the crypto industry were recently announced, and crypto is now seeing only the beginnings of what things will look like when traditional retail investment enters the market. It indicates that $3.4 billion flowed through the exchanges in 24 hours. The rally is testament to hard-earned respect from crypto enthusiasts who have come to take XRP's quick transfer times for granted on exchanges and in making P2P payments. It's a physical manifestation of momentum that's been building steadily since Ripple decided to host the SWELL conference; a move that's earned them the title of "Alternative to SWIFT" among the world banking community. Four months is an extremely short time frame in business. In fintech, that time frame is even shorter; technological development must have time devoted to various stages of the development life cycle, no matter which methodology is followed. While some timelines can be condensed, collapsed, and some activities can be done in parallel, others cannot; some activities extend the critical path of technological timelines. This timeline serves to show unequivocally that Ripple is focused on the business at hand. While some crypto businesses grab at the easy money available through ICOs, Ripple is focused on conducting business using the tried-and-true approach of actually doing the hard work to lead. They carefully evaluate, analyze & plan. Its apparent from their business alliances and sequencing of development that they are deep strategic thinkers, and it's paired up with yet another core strength - a work ethic that consistently delivers unbelievable results. While others that invest in ICOs, Bitcoin, or alternative coins are wondering if their investment will be rewarded, I'm only wondering when. That's a big difference between XRP and other choices when it comes to crypto. When free markets results in a massive spike of demand, it's natural for analysts to look backwards and attempt to attribute a cause for the surge in popularity. XRP is no different, and if we look to recent events and rumblings, we can see clearly that the information was there for active traders to access. Following are the high points. It's been fascinating watching the market's reaction to the "first mover" of smart contracts on a blockchain; Ethereum. 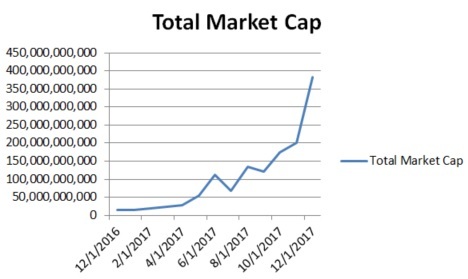 As an example of how the market rewards those crypto-currency networks that do something - anything - "first," take a look at the enormous price increases that have taken place for Ethereum. From my perspective, it indicates clearly that the crypto market will reward the innovations represented by the ability to perform a layer of business logic beyond processing and storing immutable transactions. Ripple was quick to realize the market need for smart contract capabilities. They developed their own smart contract platform called Codius, from 2013 to 2015. It was a great innovation; however, as Ripple re-positioned the various technological components it foresaw as necessary for interoperability, it became apparent that payment standards were lacking between ledgers. Still in its early years, Ripple made the difficult choice to first champion an international standard for inter-ledger communication. In hindsight, we know that it was the correct decision; The Interledger Protocol (ILP) is being used by many organizations, and of course by Ripple, to communicate between ledgers. "Now that Interledger exists, we are revisiting the idea of building smart contracts. We just released a proof-of-concept for a new version of Codius that is built on Interledger. You can expect to see more on this in 2018." "...on the Interledger front we are moving on from working on the protocol and are starting to look at early use cases. We’ll be challenging a lot of use cases for distributed protocols that are currently using custom tokens with much simpler solutions that use ILP/XRP instead. (Think custom communications protocols that are for one purpose only being disrupted by the Internet.)" This interesting comment indicates that Ripple has studied some of the payment use cases currently being serviced by "silo" solutions that include custom tokens. What are these specific use cases? Which crypto-currencies will be disrupted? That, of course, is the part where corporate secrecy lowers the curtains on our insight; but it will be interesting to watch what develops, especially since Stefan Thomas was so specific about a combination of ILP and/or XRP. New South Korean Crypto Rules? It's no secret. I've been talking about the imminent intervention by various world governments into the world of crypto. Thus far, the small size of the crypto market has been an insulating factor in avoiding this intervention; but in 2017 we've seen the beginnings of what could herald coordinated action in response to material levels of capital flight. This chart only represents one year of industry growth. Even though the overall number is still far below most analysts' expectations for the plateau of the estimated size of the crypto market, the velocity of growth has surely caught the attention of regulators across the world. The US and China led the way, with the US SEC issuing an ICO warning, and China first banning ICOs, and then all crypto trading against its fiat currency, the Chinese Renminbi. Some crypto traders speculate that South Korea might issue a similar rule to China; although the extent of these new South Korean regulations has yet to be seen, this is a big deal in crypto; South Korea is responsible for a large part of the global crypto volume at present, and represents a glimpse of what other countries can expect to see when mainstream investors enter the market. "South Korea's government decided Wednesday to roll out a series of measures to curb cryptocurrency speculation, including barring minors from opening investment accounts, officials said. During an emergency meeting of senior officials from related ministries, the government also decided to prohibit local financial institutions from possessing, purchasing or investing in the virtual currencies. The measures also include checking the identities of those doing bank transactions related to cyber-money investments." These three points actually seem quite reasonable, although I'm interested to see where South Korea draws the line on the second one - crypto trading and usage by local financial institutions. Here is where things get... interesting. "If all goes well, Ripple's blockchain payments system could carry its first real funds between Japan and South Korea as early as spring 2018. Eventually, the banks aim to send money by using Ripple's virtual currency, known as XRP, cutting costs an estimated 60% compared with conventional methods." While the initial implementation may not utilize XRP, it's clear from the article that Ripple intends for its usage to help the participating banks reach the highest levels of cost savings. It's my hope that South Korean governmental authorities understand enough about blockchain technology not to issue a blanket guideline, but instead draw a dividing line between usage of crypto in operations, and usage of crypto for investment purposes. If that's the case, then XRP could be introduced as a replacement for Nostro accounts that store fiat currencies for the banks in question. Discord is a fast-paced, real-time chat program that people use to share information and interact; it has the ability to post a rolling screen of comments, and for people to link to other information or upload graphics. The capabilities go beyond this description, but my point is that it is fast-paced, and at times, screenshots of a Discord session shared subsequently might lose contextual information important to discerning its merit or meaning. "There are two huge ones that I wish I could release. Non-banks. Household names." The reason that XRP investors are hungry for news about xRapid is that it's the only one of the three solutions of Ripple where XRP is absolutely used. The other two options - xCurrent and xVia do not prohibit crypto-currencies, but they also do not require them, either. So naturally, we are hungry for businesses to use xRapid! 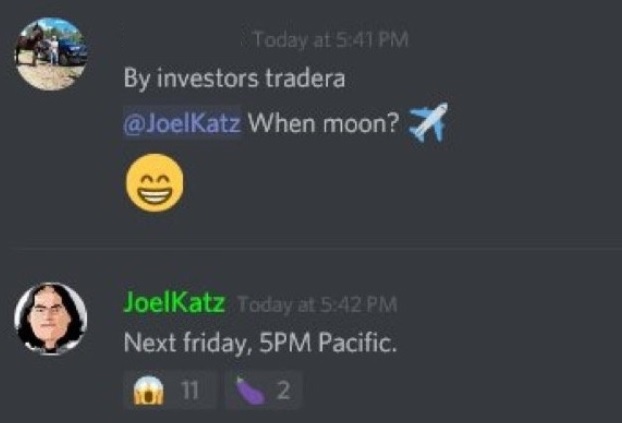 While it was crystal clear to everybody on that Discord group that JoelKatz was joking, the screenshot was shared in connection with the first statement, and people (many people) thought that an announcement of the two customers would be made this Friday. Note that the information about the two xRapid customers was not retracted in this subsequent tweet. That was the exciting part for XRP investors, and indicates that at some point, these two "household names" will be revealed. While this is the category of "rumors," I think Brad is pretty straight-forward. 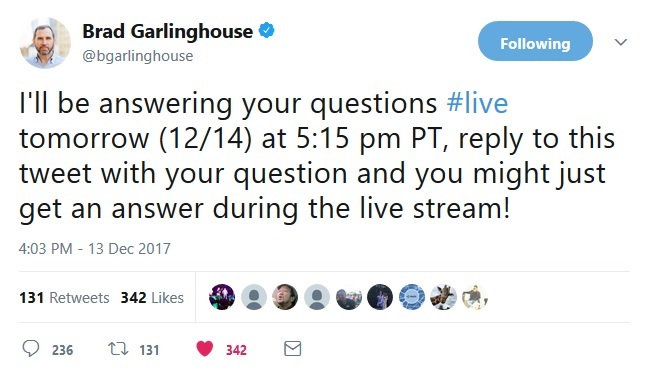 If he said it's a Q&A session, it's probably just that - Q&A. I don't think he's going to make any announcements, but there are some in the fan base that have different opinions. It was a week for rumors and conspiracies. 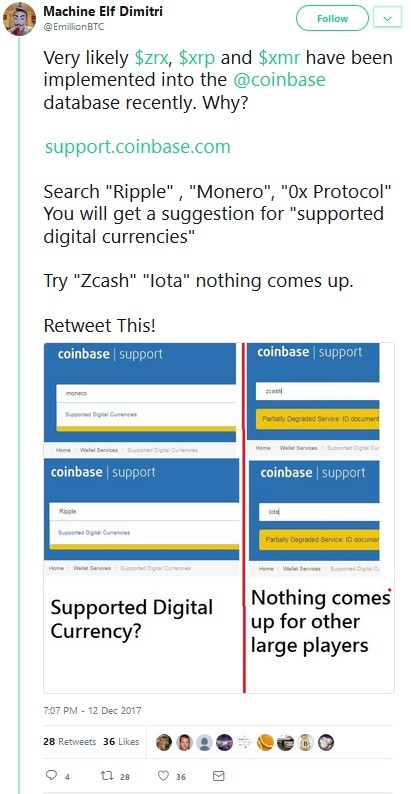 The "Coinbase rumor" (That Coinbase might soon add XRP as a direct purchase option) started off with a seemingly isolated tweet by Miguel Vias thanking Coinbase for issuing a warning for investors. My take? 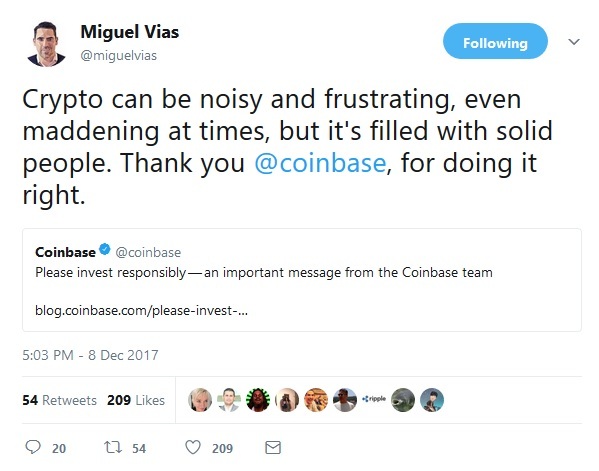 This is just a normal tweet from Miguel Vias congratulating Coinbase on doing the right thing, like it says. Ripple operates with principle-centered leadership, and his tweet is completely in line with that culture. Again, having an entry in a database means nothing in specific, but as you might deduce, any news about a high-volume exchange such as Coinbase adding support for direct fiat-to-XRP purchases would be positive news. In a recent blog, I noted the development of a new application called Reservoir. This is an end-user application that allows end-users and holders of XRP to try out the escrow functionality for themselves. An XRPChat user recently proposed the creation of a mobile payment application that might also have a desktop component. The application could be used to make direct payments to merchants. The desktop version might also contain additional functionality such as the ability to set up auto-conversions of currency and track history, among other functions. This initiative is currently at its early stages, and the software hasn't been formally christened with a name yet. If you wish to learn more, or volunteer to help develop this application, please refer to the XRPChat thread where it is discussed: https://www.xrpchat.com/topic/13162-huge-announcement-request-for-developers-xrp-b2b2c-application/ The user organizing the effort is known as "@Sancho". When the CEO of SBI Holdings tweets that he's "..all in on XRP!" 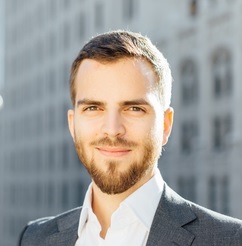 (expressing himself with an exclamation point), and the Founder of TechCrunch says he's only going to accept XRP as payment34 for his new hedge fund, it's an indication that something big is happening. If you've reviewed the list of Ripple's accomplishments to date, then you know that they do not follow; they lead. Ripple is a team that will not await the market's response to XRP before making their business and marketing decisions; they will forge ahead like they've always done, doing the most difficult work of forming business relationships and alliances, and delivering software. It's what they do. XRP investors like me don't need a "Rally of the Gods" to know when we've made the right choice. We did our research long ago and cast our lot in with XRP, knowing full well of the potential that it has for transforming the entire back-end of international payments.